Sterling Pass trailhead lies up and across the road from Manzanita Campgrounds. There is a small pullout next to the Manzanita Campground sign more suitable for high clearance vehicles. There is also a small pullout at the trailhead, which I would recommend for cars. This trail takes you up Sterling Canyon to Sterling Pass. The pass is a break in the rocky mountain so you won't be peaking out on this venture. You have the option of continuing another three quarters of a mile down the other side to Vultee Arch. The trail takes off going up a steep pitch. I was sweating within minutes. A small break in the forest opens up passing over a typical Sedona sandstone wash. By this time the sounds of the highway are behind you. The forest doesn't break away for more views until further up the trail. Passing over the wash several more times it was calm below. I could hear the wind rushing high above in the tall pines. Some of the ponderosas are extremely tall. The wash has caused them to lean every which way. In a couple of areas they have grown apart making a huge "v" and some cross paths making a huge "x". Beware of poison ivy in patches alongside the trail. You will brush against it if you don't pay attention. The poison ivy goes away soon after leaving the wash area and the ascent continues. The trail gets steeper. I imagined how tough this area would be to follow without a trail. The forest is dense making it hard get an idea of which way is which. Thankfully the trail leads the way. One area after a huge manzanita bush is extremely steep. You will likely need to grab hold of a limb to pull yourself up. On this trip in early September the scattered ferns were all dried up. Cute little baby lizards in large numbers scampered the area. The ground in the upper portions is more in front of you than under you. The baby lizards kept my eyes peeled thinking a snake was crossing at every switchback. Great views come into play before reaching the pass. You can see the canyon below and the rim in the distance. Oak trees take over as you reach the pass. There really are no great views from the pass as the trees block the view. You have the option of heading down the other side to the Vultee arch or trailhead. If you venture to the right you will see a crevasse in the rock formation. It's possible to top out and get some better views. Though I definitely don't recommend that unless you're a skilled climber. It's way too steep, actually leans outward in one section. The return trip is the best part of the hike. All the sweating is behind you. The views open up in front of you. I've mentioned it before. You feel like you've completed a long venture, now coming down the canyon to the homestead. I recommend late September through the third week of October for this hike. According to the 2018 FS map camping is allowed after 0.5 miles into the hike outside the green line. Campfires are NOT permitted in Oak Creek Canyon period so bring a good blanket and flashlight. 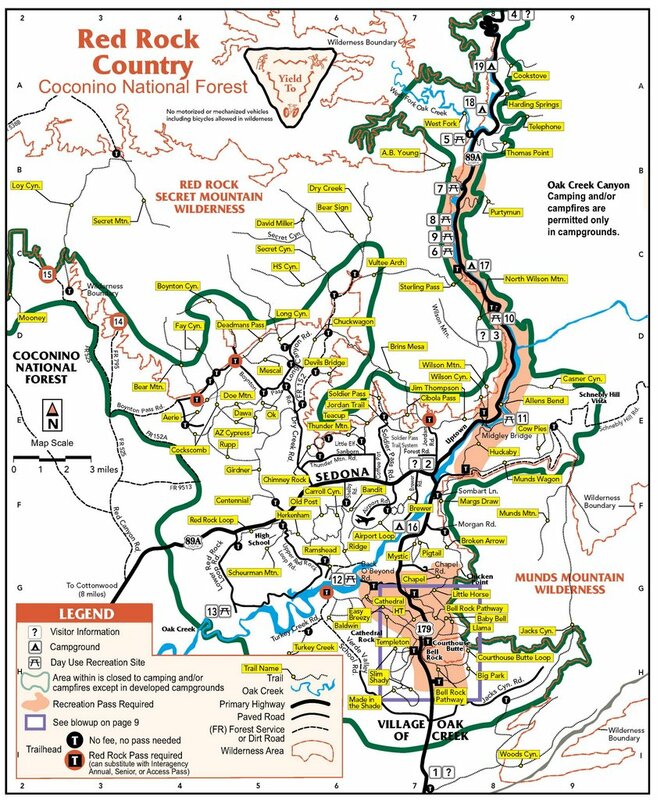 Coconino FS Reports Named for a local settler, Sterling Pass Trail leads over a high saddle from Oak Creek Canyon into nearby and equally scenic Sterling Canyon. The climb is steep right from the trailhead. The trail climbs up an unnamed drainage through a mixed conifer forest dominated by huge orange-barked ponderosa pines. Dwarf canyon maples are plentiful here too. They turn scarlet and peach in the fall, making this a great place to enjoy the most colorful of seasons. From the Sedona 'Y' ( 179/89A ) go North on 89A just past mile marker 380. Either park at Manzanita Campground ( fee area ) or if you're lucky enough to find a spot along the shoulder you're set. The trailhead is on the left or West side of the road just North of the camp area. Location: 22 miles south of Flagstaff (5.5 miles north of Sedona) on paved roads in scenic Oak Creek Canyon. Elevation is 4840 feet at the trailhead. Access: Drive 22 miles south out of Flagstaff or 5.5 miles north from Sedona. The trailhead is a bit hard to see but it's on the west side of the highway, near mile marker 380. It's about a hundred yards north of the entrance to Manzanita Campground and a short distance south of Slide Rock Lodge. Parking is available some distance away, south of Manzanita Campground, on the east side of the highway.